Federal Premium, the ammunition people, have joined with Versus TV to produce a television programme called the 'The Federal Experience'. The aim of the programme is not just to push their own brand of ammunition, but also to encourage more people to take up a past time that is nowadays almost uniquely American . A relatively novice hunter, Tim, is our host and is paired up with accomplished, recognised professionals in the field and given the chance to hone his skills, hunting a wide variety of prey across different continents. The programme covers all the skills you need to become a successful hunter and also gives a behind- the-scenes look at the whole hunting experience. Tim is our guide and our guinea pig, so to speak, and we travel on his coat tails as he hunts all sorts of creatures. To view a video of one of Tim's trips, to Haakon County, follow this link. In Season 1 Tim went quail hunting in Georgia, goose hunting in Maryland and he went after wild turkey in Montana and on a waterfowl hunt in Maryland. After something larger, Tim got to hunt Whitetail deer in South Dakota and went on an African Safari in Namibia. Season 1 aired on Versus TV between August 25th and September 29th 2007. Season 2 is now underway with Tim filming in New Mexico in March 2008. Tim proves what a good student he is. "The Federal Experience season 2 New Mexico Aoudad hunt. My New Mexico, Barbary sheep hunting experience began with a phone call to the owner/ operator of, Back Country Hunts, Steve Jones. Steve likes to get a sense of the hunters coming his way so he can better prepare for the upcoming hunt. I was able to ask all my questions up front and to give Steve my hunting experience and physical fitness level. I also got to pare down my packing list which was outstanding, because I am a notorious over-packer. My motto has always been, "Be Prepared", but when I can confidently eliminate an item, knowing I will not need it, great! My firearm for this particular hunt was going to be my, Tika T-3, chambered for the tried and true, 30.06 caliber cartridge. I was going to be using Federals awesome new Trophy Bonded Tipped 180 grain round. I say awesome because I had this exact same set up on my first hunt of season two, up in northern Quebec, at Leaf River Outfitters, for caribou and black bear. Jason Nash (Federal/ATK) was my hunting buddy and witness to the deadly effects of the new Trophy Bonded Tipped cartridge. I took two fine Leaf River caribou and a beautiful black bear in varying weather conditions, from windy and rainy to windy, rainy and cold to just plain windy, over an outstanding 6 day hunt. Our drive through, Roswell, New Mexico was indeed interesting. The theme in town is UFOs and funny green men w/ large craniums and big eyes to match. Your standard Martian. We stopped at the local gun shop, "Larry's Guns" so I could pick up a few items not available in Los Angeles. Once back on the road, we all agreed that Larry might be an alien. Interesting fellow. Things that make you go, "Hmmmmm?" Onward to Rio Hondo! I am always amazed at the size of the ranches I hunt on. When you can drive for darn near an hour on an improved road, and everything as far as the eye can see, in every direction, belongs to one ranch.... that's big! And the abundance of mule deer was astounding. This rancher definitely had a great management program in place. Things were looking good, for an outstanding hunt. Once our gear was off loaded into the bunk house, Steve Jones and Don, our camp cook and additional hunt guide, took Mike Law, Orion videographer and myself out to locate and film, some Barbary sheep AKA aoudads. I was excited about seeing these Barbary sheep! This was my first sheep hunt and also a great tune up hunt for my upcoming Rocky Mountain goat hunt later this year. 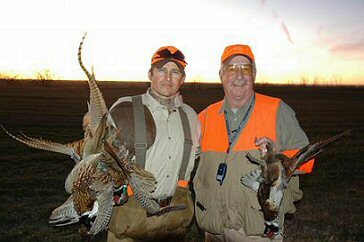 The max altitude for this hunt was around 6 thousand feet above sea level. This shouldn't pose a problem as I had just spent the last week up at Lake Tahoe, skiing for a Special Olympic event. Altitude on the mountain: 10,700 ft above sea level. My lungs were good to go! Our first day of hunting mainly consisted of glassing the rocky terrain. My Nitrix 10x42 were great at spotting sheep out to about 1000 yards. Past that point, Steve had additional optics in the form of a spotting scope and some 15x50 binoculars. It took quite a while for my eyes to learn how to find these sheep on the sides of the mountains. To wrap my brain around the concept of seeing an animal that was perfectly matched to the terrain in which he lived. Steve and Don could glance at the side of a mountain 1000 yards away and see sheep! How? Brain training! The spotting scope was used to ascertain if the aoudad was a shooter or not. These Barbary sheep have beautiful back sweeping horns that start to curl under as they mature. The record I'm told is around 38 ". We are looking for 25" and above. Preferably in the 30 inch range! As the first day was coming to a close with the sun setting, Mike Law informed us of a rather large black Russian boar, he had spotted some 80-100 yards away heading up hill. Quickly and succinctly, Steve Jones, yells, "Shoot em! ..... Hurry up and shoot em!" As quickly and as safely as I could, I jumped from the Mule, chambered a Trophy Tipped round, acquired the large boar moving quickly up hill away from me, in my 3x9 variable Nitrix scope, off hand and gently squeezed off a shot. It was a quartering away shot that struck the boar solidly in the left side and exited the right side at a sharp angle. The tipped bullet traversed through the body at a 45 degree angle. The sound of the impact was resounding. Kinda like, Rocky Balboa, punching that side of beef! Thwack! The large boar kept charging up hill cresting it and continuing on for another 100 yards before he stopped. Tough animal! One more shot to seal the deal, and we could finally see the massive size of the big boar. Steve's rough estimate was 350 + based on his experience. Huge head, with big broken tusks from digging in the rocky terrain. Over 5 feet long from nose to tail! It was a good day! At least for one of us. Day two was a long, hot, sunny, day filled with glassing and mucho sunscreen! Got some show interviews shot, drive byes, beauty shots...etc. Also, we were able to finally get cell reception! I have a History Channel pilot I'm filming soon and have to discuss details this week. Usually I throw my cell phone into the bottom of my pack on a hunt and forget about it until I'm finished, but, no can do this week. It was a great day for filming, but not many aoudads seen, except for the very end of the day when the light was to dark to film. Such is hunting. I still revel in being out on the open range; seeing the sunrises and the sunsets, enjoying the company of new friends. It was a great day! Day three started off great. We were seeing aoudads all the way to the north ranch office! When we stopped to glass an area, I happened to spot two nice rams just about to top the ridge I was glassing. I yelled for Steve to take a look before they disappeared over the top and Steve were immediately excited! Two nice rams. Two shooters! We circled wide around them to get ahead and down wind of them, but, they were moving more quickly than expected. I caught them just as they were disappearing over the next ridge. So, we hustled to circle around one more time. This time we were way ahead of them, perhaps too far. We ended up spotting two smaller rams about 1500 ft away bedded down in the sun on a mountain side out of the wind which was getting stronger every minute. Steve had us circle around yet again so we could get within range and make a sound decision on one of these rams or perhaps bump into another along the way. We took our time and climbed to 5,000+ ft into a position that got us to with in 577 yards. Need to get closer. After another hour, and bumping a great ram on top of the mountain, we got to with in 385 yards of one of the rams. Too small. Definitely not a shooter. Mike did get some great footage though. The other ram had disappeared towards the bottom. Where was he and how big was he? We decided to move farther around the side of the mountain to glass the bottom and the next ridge. As Steve moved cautiously along the rocky terrain, he suddenly stopped. There the ram was, 200 yards ahead, slowly feeding and moving up hill; totally obliviously to us. Steve ranged him, and I moved forward to get to within 150 yards because of the stiff cross winds we were encountering. I slowly settled in using an indigenous brush as concealment. I dropped my bipods and extended them. I slowly chambered a round. Steve reminded me of the cross wind, as I acquired the aoudad in my cross hairs. I waited for the aoudad to present a left broad side shot. As the cross hairs settled just behind the left shoulder, I flipped the safety off, took a breath, slowly exhaled about half of my intake and gently squeezed off a round. Thwack! The Trophy Bonded Tipped 180 grain 30.06 dropped the ram in place! 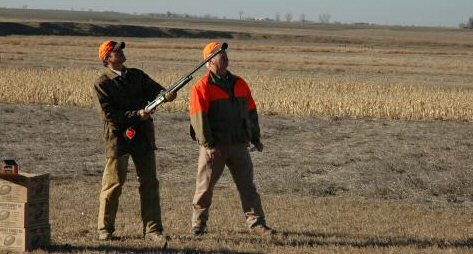 After packing the sheep out, and reflecting on the hunt, I realized that I had learned so much from Steve and Don. My first sheep hunt was an outstanding experience and has wetted my appetite for future sheep hunts and more challenging adventures with Back Country Hunts."